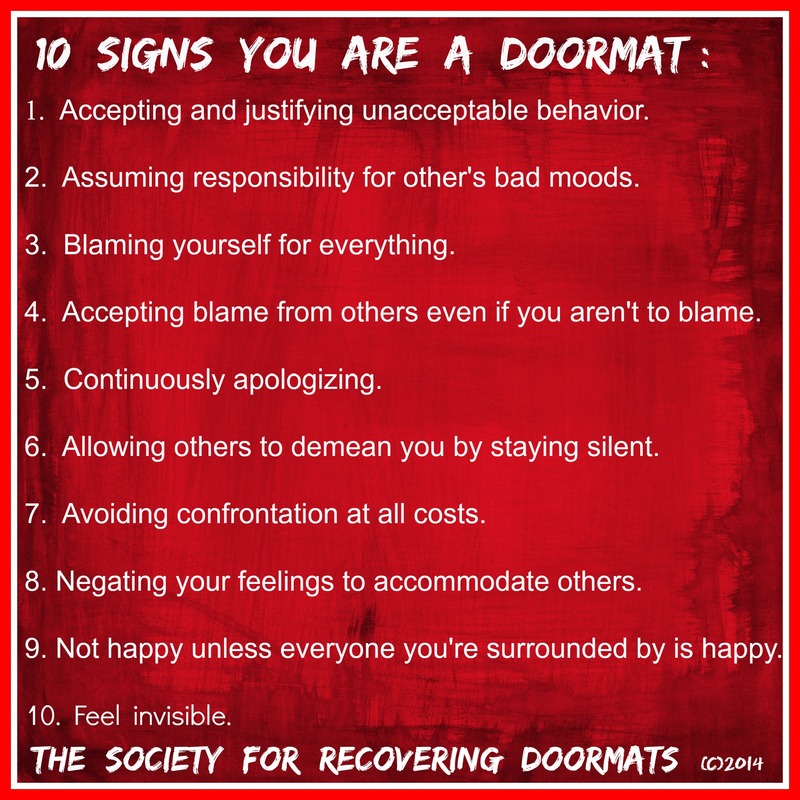 If any of these ten signs are familiar, chances are you’re a doormat. But take heart, you are capable of recovering from this matty lifestyle and moving out of doormat status. It is possible to overcome doormatism. I wish to express my respect for your generosity supporting men and girls who require guidance on this one topic. Your particular commitment to getting the answer all-around has been specifically crucial and have all the time created those a lot like me to attain their objectives. Your incredible important recommendations implies a lot a person like me and a whole lot a lot more to my office workers. Finest wishes; from each 1 of us. Thanks so much Thu Asaro. 🙂 Rose G.
Thankx so a lot for this! I havent been this thrilled by a post for a long period of time! Youve got it, whatever that indicates in blogging. Anyway, That you are undoubtedly someone that has something to say that men and women need to hear. Maintain up the good job. Maintain on inspiring the people! Thanks so much Caprice. 🙂 Rose G.
I found your page right after I made a big stand with my adult children. The timing was perfect. Even though they wont let me see my grandchildren as my punishment, it had to be done. I am grateful for your posts. Timing is everything Carleen. Thanks so much for being here. Welcome. Carleen I feel your pain. I am in the same boat! I can’t see my grandson because I stood up for myself! Me too. I finally stood up for myself. Was immediately accused of being mentally unstable and also stopped from seeing my granddaughters. It is now six years since I saw them. Carleen Sills, I have been a doormat for my adult son and after an argument we are estranged since February. I miss my son & grandbaby but I don’t miss the disrespect. It feels good not to be a doormat!!! Hi Maya, I am sure you’re struggling with missing your son and grand baby, but being disrespected is TOO HIGH A PRICE to pay for your son to be a par at of your life. Perhaps one day he will return and treat you with the respect you deserve. Good for you for not taking the abuse. Congratulations on being a recovering doormat, and a mat-no-more <3 Rose Gardner, creator and founding member of The Society for Recovering Doormats. I, too , carleen , am being punished for standing up to my daughter and son in law. They have stopped me from seeing my granddaughters. It’s seven years since I saw them.I was a doormat, apologising, grovelling and taking the blame for stuff I haven’t done. I have an adult daughter who is thoughtless an cruel, I am disabled an she takes advantage of me, she moved in my home then without my permission moved her boyfriend in when I was at church, they bullied me an abused me while they destroyed my house. Police were no help telling me they were residences I couldnt get them removed. Finally a judge made them move, and they were gone for 4yrs,,then out of no where after no hearing from my daughter all that time she calls me begging to come back she had broken up with boyfriend had no where to go ,,so I laid down ground work to her about rules in house an with me ..an let her back. Well she followed them for awhile an now she is back to her narcissitic behavior. And does not help in the house an is abusive of me. I am older now an need help doing things in my home she wont lift a finger to do anything but will make bills go up by leaving lights on, etc. She has no car but uses mine without permission. I tell her about it but she attacks me over it ,,it doesnt get any better. LIfe is horrible. She is using me to get her life back in order while she is destroying me. Sure she got a job, an is storing away her money so she can go get her a place while she is putting me in the hole. I cant get her to give me a dime! Not even for gas she is using my car to go back an forth to her job. Or to get oil changed in the car. I cant take it anymore! Yes I talk to her about but it goes no where. Do you have any friends or relatives that care about your well being? How about having them stage an ‘intervention’. They can pack up her stuff, while she’s at work, and when she returns.. force her & her crap out. Sounds easy to do Susan, but I am thinking it is hard for a Mother to do that. A lot of ‘tough love’ is needed, and unless Catherine is ready to take action it probably won’t happen. Although it would probably help her child grow up. Thanks for shouting out <3 Rose G.
Thank you, Rose, for heightening everyone’s awareness of this important issue. LOVE LOVE LOVE your website and Facebook posts! Thank you so much Shelley! You made my morning with your comment. Thanks so much for being with us. <3 Rose G.
Thank you Rose for you imput, I put boundaries as you suggested but they are not listened too. I end up locking myself in my room because it gets me too sick to always be yelled at by my daughter. She is a bully. You know you can TELL someone but it dont mean they listen or will do! Hi Catherine, that is true: you can tell someone, but you can’t make them listen. Continue standing up for yourself. It takes a long time until these bullies get that we are SERIOUS and back down. It takes day in and day out REINFORCEMENT of your new set boundaries. Please keep trying, it will get better. Hugs, and thanks for shouting out today. How do you stop or change this? Almost everyone is can bully in their own way. My husband set the trend. I didn’t use to be a doormat, but in doing so has cost me years of my life and bad parenting for my children as they’re learning that dad can run all over mom. I hate it, but I’m changing it now. So glad you are changing it now Lynn. It is never too late to stand up and speak out. Never to late to claim your power and declare yourself a recovering doormat! I am married 30 years found out from everyone I married a person how has Narcissist Type personality. He’s the type who has no faults will not take blame for anything he has done to his wife or family.. Does not help that he has a list of health problems he needs med’s to keep him walking etc. but those med’s all have side effects.. So when you mix the side effects & Narcissist it’s the hardest thing to live with a person with all that.. Thank you so much, you know the first thing we need to know and admit to ourself is to recognise is we are being hoodwinked and abused, sometimes that takes an enormous amount of guts, I think even tougher for a male. But with your amazingly enlightening page and posts, yes it is time to get up and move, you are the motivation in my world. Thank you so much. I just need to find a way to leave without the war, is it wrong to want to leave in peace? It is a most noble desire to leave in peace. And most people in doormat status feel this way. We are kind, loving, peaceful people and we don’t want to hurt or disappoint anyone. After all, that is how we got here in the first place, right? Hold on to those beautiful intentions, but let go of anyone who doesn’t APPRECIATE your worthiness. Sometimes, and against our good nature, it is not possible to ‘leave in peace,’ but we must push ourself and exit any toxic situation ASAP and many times our empowered, RECOVERING DOORMAT behavior ruffles a few feathers. That is NOT our problem. We must serve our greater good. <3 Rose G.